Use this secure order form to order stock Wesco Boss Engineer boots. These are boots which are usually on the shelf and ready to ship. No options can be added to these boots since they're already built. If you'd like to order Boss Engineer boots in sizes not available here or with options such as steel toes, please click here to go to the order form for Custom Boss Engineer boots. The custom boots are currently taking about 14 weeks to build. Extra Tall Wesco "Big Boss" Engineer Boot page. If you need more options or size choices, click here to go to the order form for custom boss engineer boots . Before ordering these boots, please check your calf and heel measurements to ensure that you can get your legs into the boots. This check is required for the 16" boots. Although the top of the 11" boots have the same size as the calf on the 16" boot shafts, your calf circumference at the 11" height is normally not an issue but your heel could be. Your calf is the large muscle in the lower leg below your knee. Wear the socks and jeans or breeches that you plan to wear tucked into the boots. Find the widest point on your lower leg and measure the circumference (distance around the leg with jeans or breeches) at that point. You will need a measuring tape or you can use a piece of string then measure the length of the string with a ruler. Wrap the tape around the calf. The tape should be comfortably snug but not tight. If this calf measurement exceeds the measurement in the table for your size, the standard boot shafts will be too tight for your leg to fit into the boots. In that case, the stock boots will not fit and you will require custom Wesco boots. Go back to the Wesco Boss boot page. The custom boot info is just below the stock boots and there is a different order form for the custom boots. The table below shows the maximum calf measurement for each size of stock Wesco boots in Inches and Centimeters. This is largest size calf which will comfortably fit in this size boot. 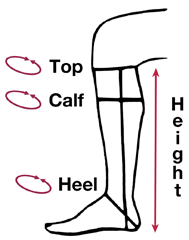 You should also check your heel measurement referring to the chart on the right below to see where to measure. If your heel measurement is larger than the max calf size for your boot size, your foot will be too large to fit into the boot. now, we will have a pair built for you at the same price. in the Remarks box below. To determine where the top of the boot will be on your leg, measure 11" / 28 cm or 16" / 41 cm up from the heel of your stockinged feet along the back of your leg. This should be done while in a seated position with the knee bent at a 90 degree angle. The initial height of Boss Engineer boots will be exactly as measured. e.g. if you order a 16" boot, it will come up 16" from your heel. They may even be slightly higher when new. The 16" Boss boots will drop about 1" as they break in because of the flex in the ankle area. The 11" Boss boots will drop very little as they break in. Note: When ordering the 16" boots, please check your calf size to ensure that your legs will fit comfortably in the shaft of the boots. See the instructions on the Boss Engineer Boot page.